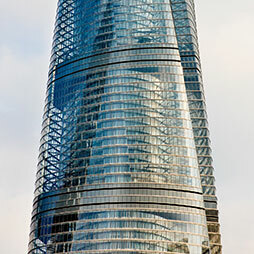 150m+ Buildings 26 Completed • 6 Under Constr. 300m+ Buildings 1 Completed • 3 Under Constr. 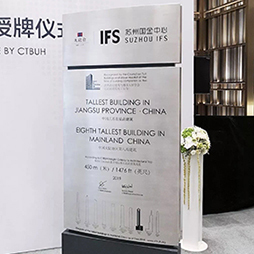 The tour started at Suzhou Zhongnan Center and continued to one of the two International Fortune Plaza towers, which had just had its topping-out ceremony the day prior. 18 Sep 2014 – Presentation at CTBUH 2014 Shanghai Conference; LiJun Cao, Environmental Market Solutions, Inc.
16 Sep 2014 – Suzhou Zhongnan Center: In Detail; Jiemin Ding, Xin Zhao, Kun Ding & Fang Xu, Tongji Architectural Design (Group) Co., Ltd.
16 Sep 2014 – Suzhou Zhongnan Center: In Detail; Weiguo Chen & Guangjing Sha, Zhongnan Construction Group Co., Ltd.; Xin Zhao, Tongji Architectural Design (Group) Co., Ltd.
16 Sep 2014 – Suzhou Zhongnan Center: In Detail; Li Cao & Guangjing Sha, Zhongnan Construction Group Co., Ltd.; Xin Zhao & Kun Ding, Tongji Architectural Design (Group) Co., Ltd.
16 Sep 2014 – Suzhou Zhongnan Center: In Detail; Xin Zhao, Kun Ding, Fang Xu & Rong He, Tongji Architectural Design (Group) Co., Ltd.
16 Sep 2014 – Suzhou Zhongnan Center: In Detail; Qiping Weng, R.B. Liu, Weidong Wang & Z.H. Wu, East China Architectural Design & Research Institute Co., Ltd.
16 Sep 2014 – Suzhou Zhongnan Center: In Detail; Jiangbin Wu, Weidong Wang, Yuting Huang, Xiangjun Wang & Shubo Nie, East China Architectural Design & Research Institute Co., Ltd.
16 Sep 2014 – Suzhou Zhongnan Center: In Detail; Xiaomei Lee, Frederick Liu & Liming Zhou, Gensler; Steve Edgett, Edgett Williams Consulting Group, Inc.